WOLD NEWTON. On Sunday evening a sermon, introductory to the right observance of the Queen’s Jubilee, was preached by the Rector on the words, “Rejoice with them that do rejoice,” Rom. xii. 15v. On Tuesday, Mr. Coates Sharpley and Mr T. Coates gave a half day holiday to the two farms. 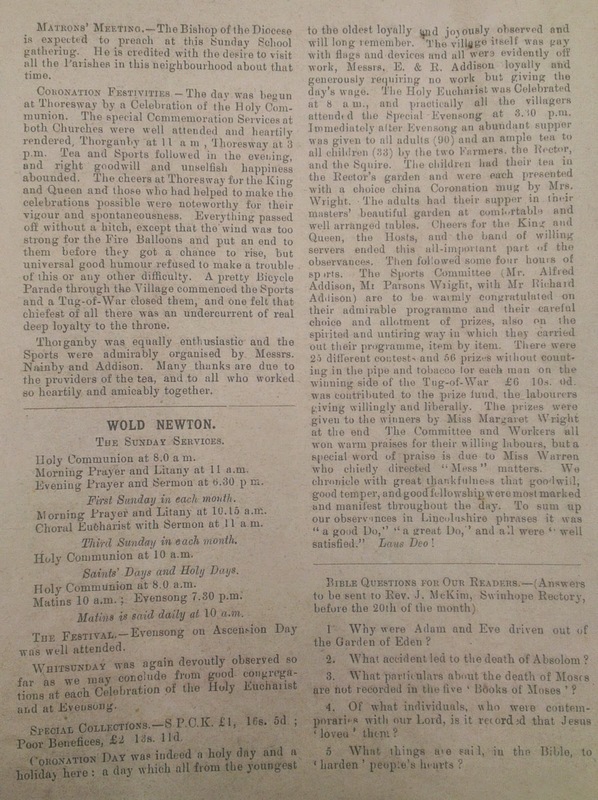 At three o’clock the children of the school, decorated with Jubilee stars, with a new British banner preceeding them, carried by the church warden, and headed by the Rector, marched to church, singing a Jubilee hymn. The church was quite full. The Rector took the thanksgiving service, and a very hearty loyal sermon was preached by the Rev. H. F. Goffe, rector of Thorgandby and curate of Ravendale and Hatcliffe, from the 107th Psalm, v.8. The service was concluded by singing the National Anthem. Afterwards the children and parishioners followed the clergy through the rectory grounds and marched in procession to the valley, where various sports were commenced. The children had their tea in Mr.Coates Sharpley’s barn at 5 o’clock, and at 5.30 all the parishioners, except a very few aged and sick, sat down to well supplied tables in the barn. Hearty cheers were given for Mr. and Mrs. T. Coates, who were present, also for Mr. and Mrs. Coates Sharpley, who were detained by festivities at Kelstern. After tea, a most enjoyable evening was spent in the valley, great amusement being afforded by the various contests up to about nine o’clock, when all returned to Mr. Sharpley’s stackyard, and concluded a very happy day with again singing, “God save the Queen,” followed by three cheers for her Majesty and three very hearty cheers for the Rector and his family. Mass at 8 for Coronation. Tremendous gale from WSW big clouds and few heavy drops at times and brilliant spells. Parsons hangs up fairy lamps. Go to Yon End to see how preparations are going on. Service 3.30 simply packed with people. Children's tea at Rectory. Big feed in Grange directly after, keeps fine. Sports on the Shepherd Hills directly after. Win sack race, 2nd in 150 yards, beaten by Alfred (presumed Addison.) All goes off splendidly without hitch." The occasion of the coronation of King George VI seems to have been a more subdued affair. A plane tree, presented by William Wright, was planted in the churchyard by the Rev. Bettison. Details attached below. When the Golden Jubilee of Queen Elizabeth II was celebrated in 2002, we were spared the sermons and, indeed, it was an entirely secular affair. The roll-call, notes of some of the activities and photographs are attached below. You'll need a magnifying glass for the photos, but prints are available on request by clicking the 'Contact' tab on the left. Of even greater interest is the booklet compiled by Sally Harniess entitled, 'Moments in Time', which has some history of the village and its people and lots of photographs, both contemporary and historical.